Imran is a payments expert who has worked at some of the World’s biggest banks over the last 20 years. These include Citibank, HSBC, Barclays, and Bank of America Merrill Lynch. 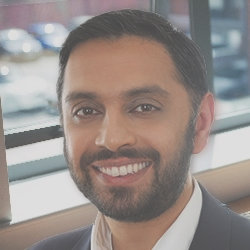 Imran worked on the implementation of Faster Payments in the UK, and has also developed online and mobile payments propositions and written European payment strategies for banks. He is a recognised expert in his field, a conference speaker and has represented banks at senior Industry bodies. With our new London business address in the iconic building The Shard, Answer Digital is growing a presence to support our clients digital ambitions. From Fintech to Digital Health, Answer have brought together experienced industry practitioners to help guide our customers through a fast changing customer centric landscape.